The gap between the wealthiest and the poorest Americans widened over the past decade, according to a new report from the Census Bureau. It also grew between younger and older families. The report on household net worth showed that median net worth for the country as a whole declined by 6.8 percent between 2000 and 2011, to $68,828 from $73,874, in constant 2011 dollars. But the results varied dramatically by wealth group. Those in the bottom quintile, or lowest 20 percent, had a negative median net worth of $6,029 in 2011, compared with negative $905 in 2000. Those in the second-lowest quintile saw their assests drop by nearly half, to a median of $7,263 in 2011 from $14,319 in 2000. 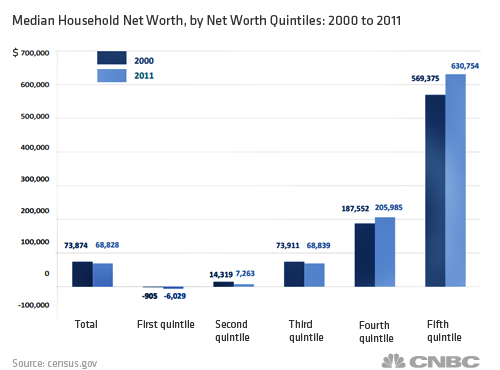 Those in the top quintile, however, saw their net worth grow by more than 10 percent, to $630,754, over the same period. While the report doesn't give a reason for the diverging paths, wealthy families have benefited more from the rise in stock markets and rebounding home values, while those at the bottom are still feeling the impact of high unemployment. "The distribution of net worth became more spread out between 2000 and 2011," the report said. The wealth gap is also growing between generations. People 65 and older were the only age group to see their median net wealth grow over the period, rising to $170,516 in 2011, from $146,205 in 2000. Those younger than 35 saw their net worth drop to a median of $6,676 from $9,765. When it comes to education, those with a "bachelor's degree only" were the only group to see a rise in median net worth. Those with no high-school diploma saw the biggest drop, of 55.7 percent.